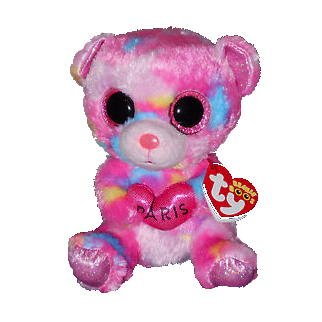 Paris is a bright pink bear covered in blue and yellow patches. She has large, glittery pink button eyes and a bright pink button nose on a pale pink muzzle. The inside of her ears and the soles of her feet are sparkly and pink. She carries a shiny pink heart in her paws with the word “Paris” written on it. Paris was released in March 2016. She doesn’t have a Birthday or poem in her swing tag. There was another bear called Paris released in 2015. These two bears have exactly the same style number.